The Andes have some great ski touring and mountaineering terrain, with everything from accessible backcountry day trips near downhill resorts to committing expedition skiing on the Patagonian ice-caps. In between these extremes are some very quiet and scenic mountain areas with excellent ski-mountaineering and ski-touring terrain. This page concentrates on the peaks and tours accessible from Argentina that we have done in the past. See the Chile Ski Mountaineering page for details of good ski tours accessible from Chile. ANDES regularly organise and lead ski-mountaineering courses and expeditions in Argentina and Chile, for more details of the trips I am currently offering please see the Calendar page. There is a short chapter on ski-mountaineering and many suitable ski ascents are also described and pictured in my guidebook - The Andes, A Guide for Climbers. Snow conditions aren't at their best (or at least their most reliable) as you head north in Argentina, but the skiing can be good, particularly if you get lucky with a recent dump of snow, and the dunes around Fiambala make for some great sandboarding! The 6793m high Nevado Pissis is probably the most reliable peak in the Puna for a ski descent. With a 4x4 base camp at 4600m, and the lowest part of the northeast glacier at just 5400m, it should not be too long a carry. Could be a lot less if you get lucky with a recent snowfall. In this part of the Andes most snow actually falls as intermittent summer storms, winters are generally direr, and at these altitudes really just way too cold. Of course, if it is too hot and not snowy enough to ski you can always take up sandboarding... good fun and you don't get cold hands.! Skiing at over 4500m at the Paso del Agua Negra in October 2009... the peaks in the background are over 6000m high. Skiing was a bit thin by the road here, but we set off on a good short tour up a small glacier just the next day. This road could give good access to some nice high-altitude skiing terrain earlier in the winter. In the central part of the Argentine Andes there is some great ski-touring around Mendoza, at heights of 2500-4000m, all accessible within a two or three hour drive of Mendoza city, with relaxing hotels, great food and wine and usually pretty warm in the July-September ski season.! Skiing down the closed off pistes at Vallecitos in the Cordon del Plata. On this trip there wasn't so much snow left in the Cordon del Plata, but it had been a lean year. Skiing at 4000m in the Quebrada Matienzo, near Aconcagua, Argentina, October 2009. In three weeks of skiing in 2009 we had 95% blue skies and no rain or storms. Just red wine, very skiable spring snow and lots of sunshine! Heading in to the mountains and the Quebrada Matienzo. The big peak is the 4900m high summit of Matienzo. We skied from the smaller peak on the ridge running towards the camera (c. 4200m). Near the ski resort of Las Leñas is some very accessible backcountry ski touring, at altitudes of up to 4000m. Recommended are tours to El Soldado and Cerro Deshecho, also the peaks of La Horqueta and Las Hoyadas near Los Molles. the next valley north is the very remote Atuel river, there are one or two good tours up here as well and it is worth visiting just for the remote and idyllic scenery. Skinning up towards the rock pinnacle of El Soldado, above Las Leñas, on a hot afternoon in late September.... and below, climbing in the early morning past Volcan Sosneado, the most southerly 5000m peak in the Andes. Chris skiing down from the Mirador del Sosneado. Big smiles after what was our best (and fastest) ski descent on the trip. Just a ten minute walk back to the mountain hut for a brew now.! Often nominated as the highest peak in Patagonia Volcan Domuyo lies entirely in Argentina north of the town of Chos Malal. There are some large and steep glaciers on the mountains south and eastern side. it makes a good ski objective on its own, taking 3 or 4 days to climb and descend, and there are several other good peaks in the area. Volcan Domuyo from the southwest in winter. The route is more or less up the centre-right hand side of the photo. Skiing down from the summit of Domuyo, October 2006. Our high camp was in almost the exact centre of the picture. Skiing Volcan Lanin, Chile-Argentina border, September 2007. 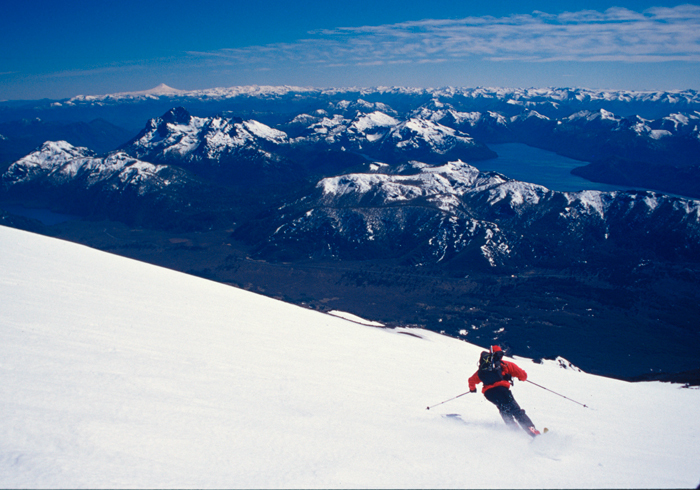 The Patagonian ice-caps provide some superb skiing terrain, although the weather is not always good. 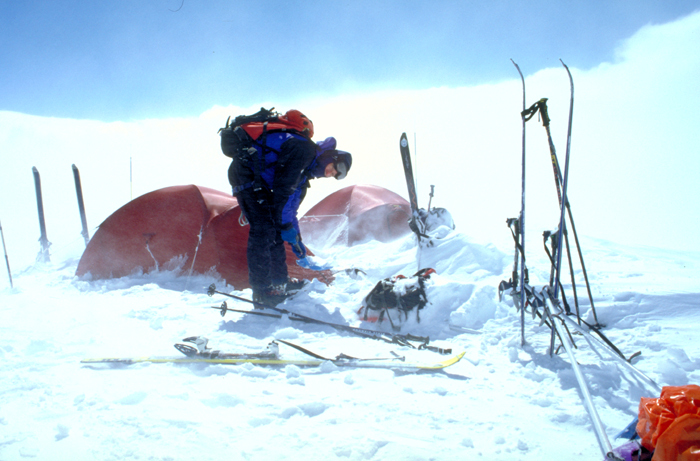 ANDES ran our first trip there in January 2000 and go back with a new expedition every few years. The picture below was taken on a ski ascent of Volcan Lautaro 3380m, a remote volcano in the centre of the ice-cap. Climbing Volcan Lautaro on the South Patagonian ice-cap. 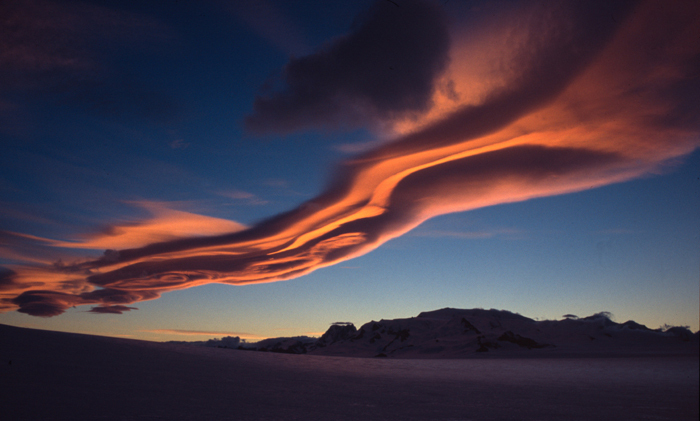 Pictured below dragging sledges towards San Valentin, the highest mountain in Patagonia, located on the eastern fringes of the Hielo Patagoina Norte. 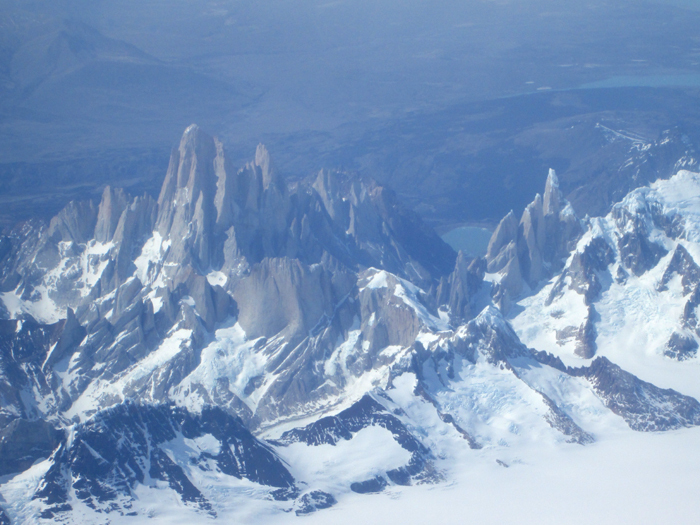 An aerial view of Fitzroy and Cerro Torre on the edge of the south Patagonian ice-cap. 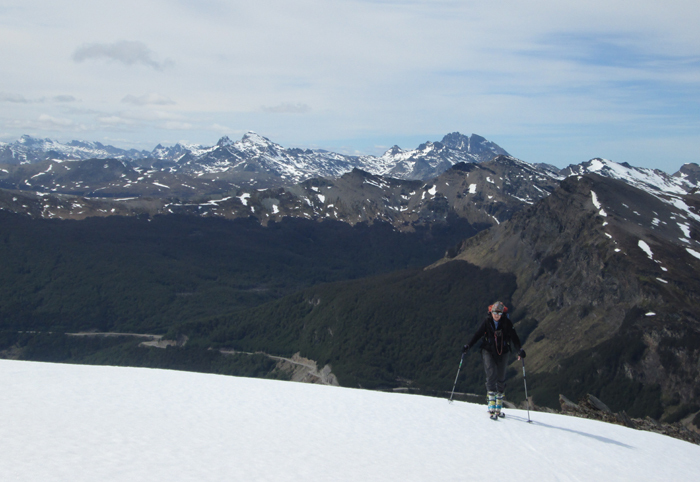 There are a few fairly accessible ski options on the Argentine side of Tierra del Fuego island. A number of good short ski peaks can be done form Paso Garibladi to the east of Ushuaia, and nearer the town the small ski fields at Cerro Castor and Glaciar Martial have short backcountry options as well. However in many places access to the snow is a bit difficult due to the impenetrable forests. 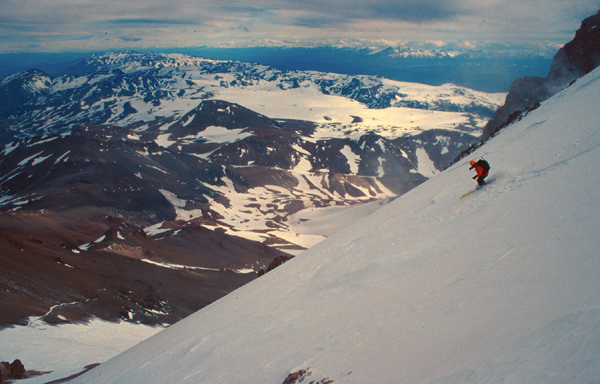 Skiing near Paso Garibaldi, Tierra del Fuego. 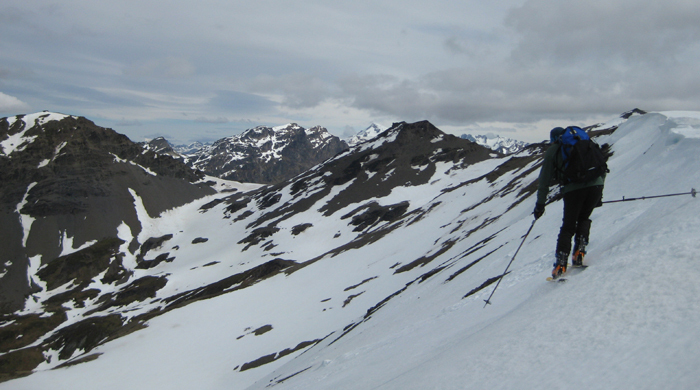 Skining up a peak in the Darwin range, Tierra del Fuego.